BURBANK, CA (February 6, 2013) - Get set for more outrageous, animated cat and mouse high jinks! Warner Bros. Home Entertainment is set to unveil another volume of Tom and Jerry classics with the release of Tom & Jerry Golden Collection: Volume 2 . Available in stores June 11, 2013, this must-own set will feature a definitive lineup of 42 re-mastered theatrical shorts directed by William Hanna and Joseph Barbera. Tom and Jerry's escapades have never looked better on the small screen. Each cartoon has been re-mastered from the best surviving/earliest generation film elements, in order to create a reproduction that is most faithful to the original. Blu-ray(TM) technology further delivers superior picture quality, allowing viewers to experience these legendary classics in a whole new way. 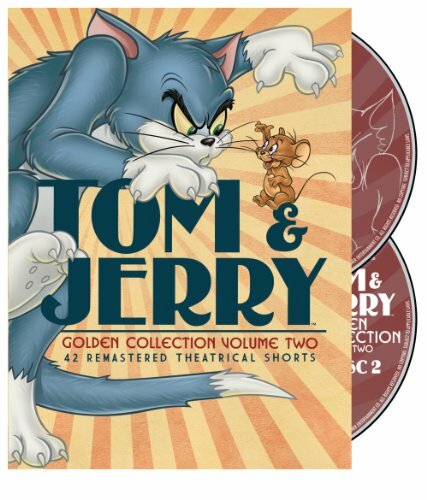 Tom & Jerry Golden Collection: Volume 2 will retail for $26.99 SRP (standard DVD) and $34.99 SRP (Blu-ray). Tom and Jerry have chased their way over the funny bones and into the hearts of moviegoers, television viewers and Internet users for generations. The iconic team's most memorable adventures are featured inside this delightful two-disc collection of 42 re-mastered shorts and bonus material. Among the 42 cartoons showcased on Tom & Jerry Golden Collection: Volume 2 , three are Academy Award(R) winners (Best Short Subject: Cartoons). They include The Little Orphan, in which Jerry takes care of Nibbles, a hungry little mouse who causes chaos at the Thanksgiving table; The Two Mousketeers, which features Jerry and Nibbles as two mousketeers who try to help themselves to a banquet that Tom is guarding; and lastly, Johann Mouse, which stars Jerry as a music-loving, little mouse who lives with composer, Johann Strauss in Vienna. The collection also showcases two Academy Award(R) nominated shorts (Best Short Subject: Cartoons). These include Hatch Up Your Troubles, which features a baby woodpecker who thinks Jerry is his mother and Jerry's Cousin, which has Jerry summon the help of his cousin, aptly named Muscles, to show him how to defend himself against Tom. Other featured cartoons include, Just Ducky, in which Jerry teaches Quacker, a darling baby duckling, how to swim and Smitten Kitten, which features Tom, who falls head over heels for a beautiful feline, prompting his losing all interest in chasing after Jerry. The tussling twosome conduct an orchestra in Tom and Jerry in the Hollywood Bowl. In Saturday Evening Puss, Jerry's beauty sleep is interrupted when Tom invites his buddies over for a party that includes plenty of loud music. In Tennis Chumps, all sorts of bad things happen to Tom; his racket catches fire, he becomes tangled in the net and swallows a bunch of tennis balls before he loses the match to Jerry, who wins a trophy. Bonus material on the DVD includes six new commentaries and an all-new featurette, Animal Antics: The Friends and Foes of Tom and Jerry. Originally created by William Hanna and Joseph Barbera, Tom and Jerry centers on the never-ending rivalry between Tom the cat and Jerry the mouse. The plots of each short usually center on Tom's attempts to capture Jerry. Jerry however, is clever and quick on his feet so Tom hardly ever manages to catch him. The original series is notable for having won the Academy Award(R) for Best Short Subject: Cartoon seven times. Tom & Jerry Golden Collection: Volume 2 is intended for the adult collector and may not be suitable for children. "Our goal was to bring these legendary classics fully restored to their original beauty through today's technology," said Mary Ellen Thomas, Vice President Family & Animation Marketing and Partner Brands. She added, "If you want to experience these cartoons the way moviegoers originally did decades ago, uncut and unedited, Tom & Jerry Golden Collection: Volume 2 is a must-own DVD." Cue Ball Cat That's My Pup! Academy Award is the registered trademarks and service marks of the Academy of Motion Picture Arts and Sciences. Warner Bros. Animation (WBA) is one of the leading producers of animation in the entertainment industry, with an innovative and talent-rich roster boasting some of the most accomplished writers, producers and artists working today. The studio is on the cutting edge of animation technology and has both CG and traditionally animated projects in current production and development. For TV, WBA produces series such as Green Lantern: The Animated Series, The Looney Tunes Show, MAD, Scooby-Doo! Mystery Incorporated and Young Justice: Invasion, as well as the forthcoming Beware The Batman and Teen Titans Go! for Cartoon Network. WBA also produces series and additional original content -- including animated shorts -- for Cartoon Network's multiplatform branded DC Nation programming block. In addition to TV programming, WBA produces theatrically released CG cartoon shorts featuring iconic Looney Tunes characters, rendered in stereoscopic 3D. WBA also creates the highly successful series of DC Universe Original Animated Movies for DVD. Producing for multiple platforms including TV, digital and home entertainment both domestically and internationally, WBA is highly respected for its creative and technical excellence, as well as for maintaining the Studio's rich cartoon heritage. It is also the home of the iconic animated characters from the DC Comics, Hanna-Barbera, MGM and Looney Tunes libraries. One of the most-honored animation studios in history, WBA has been honored with six Academy Awards(R), 35 Emmy(R) Awards, the George Foster Peabody Award, an Environmental Media Award, a Parents' Choice Award, the HUMANITAS Prize, two Prism Awards and 20 Annie Awards (honoring excellence in animation).